My cherry tomato plants have been popping out plenty of yummy morsels of heaven. Very few have made it indoors and none have actually made it to a salad. I’ll put a small handful in a bowl on the counter, and they’ll be gone in very short order. Everybody should have a cherry tomato plant growing in their yard. My plant with the big red tomatoes has been producing a good number of fruit as well. I’ve had probably 30% of the crop lost to bugs of some kind: worms, and this nasty black beetle thingy. Bill suggested a pesticide, but I just couldn’t do it. I eat that stuff. Yes, I buy regular veggies at the store and I know they’ve been sprayed…but I don’t see that happening. I just can’t knowingly spray my own food. If you think I’m crazy, you and my husband can shake your heads at me together. The big tomatoes are quite good and we’ve been enjoying BLTs, burgers and grilled cheese with thick slabs of deliciousness. I was really frustrated by my 4th plant which had a plethora of tomatoes, but before they had a chance to turn red, they would rot away, victimized by an unseen menace. I finally figured out this weekend that the culprit was TIME. They weren’t red tomatoes, they were yellow tomatoes, so they had gotten overripe and then rotted on the vine. Lesson: know your tomatoes. Finally, here’s the dessert we had last night: berry dessert pizza. The dough is sugar cookie dough. 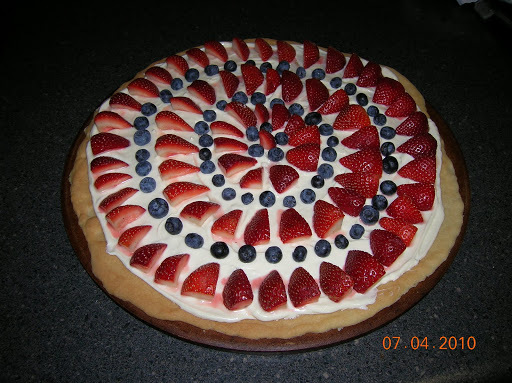 The sauce is cream cheese frosting, and I used strawberries and blueberries for topping. If you really love your family, you will make it from scratch, of course. But just in case you feel pinched for time or there is a great sale at the local supermarket, one package of store-bought dough and one container of frosting are the perfect amounts for the pie. I thought I was doing a great service by neatly arranging the berries instead of just tossing them on. One caveat: this pizza does not keep. The cookie will be soggy by morning, so be generous in dishing it out. 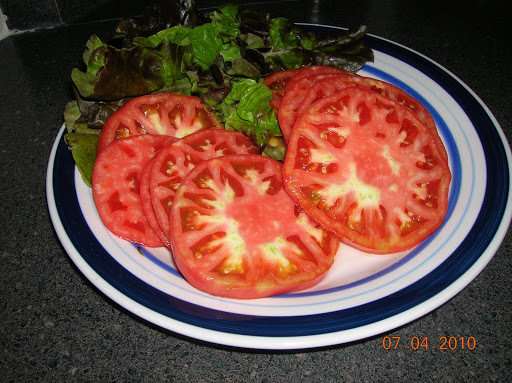 Just got some Jersey tomatoes–grilled cheese for lunch today! If you're interested try a little dishsoap in a spray bottle for the tomatoes. I've used it in the past and it seems to work well if you do it at least twice a week. Friends used some type of listerine spray too. When I googled there were many “recipes” to choose from, I simply use a squirt of dishsoap in a spray bottle. I agree with Becky about the dish soap spray. Someone told me about it recently and I'm going to try it on my tomato plants.